These are very slim, extremely light weight batteries based on Lithium Ion chemistry. 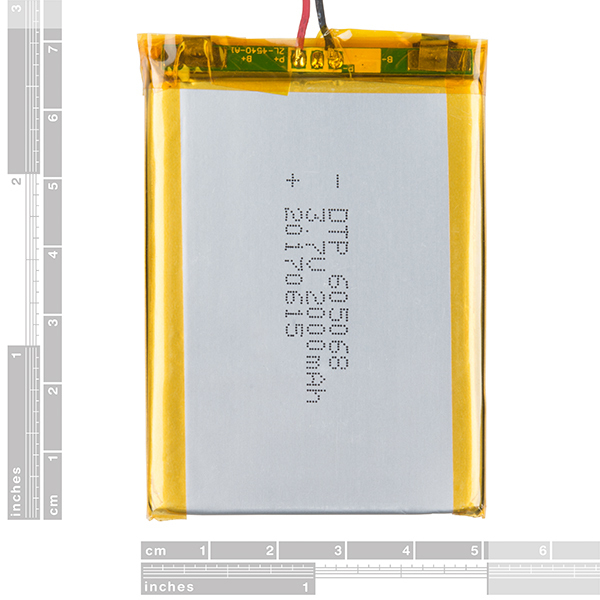 Each cell outputs a nominal 3.7V at 2000mAh! Comes terminated with a standard 2-pin JST-PH connector - 2mm spacing between pins. These batteries require special charging. Do not attempt to charge these with anything but a specialized Lithium Polymer charger. Battery includes built-in protection against over voltage, over current, and minimum voltage. Please use caution when using this battery in wearable projects. When using conductive thread, a short in the thread can create sparks and heat. We recommend using coin cell batteries for beginners. What is the maximum current draw? Can these batteries be connected in series to provide 7.4v with 2000mAH? I was wondering why this battery replaced this one: https://www.sparkfun.com/products/retired/8483. The other battery had great reviews, what is different about this battery to justify a new product number and page? They appear to be almost identical. Mostly we got them for a more reliable supplier with better documentation. They should be pretty much identical, just with more documentation. I agree, they are not dimensionally equivalent. The added thickness doesn't fit in my enclosure. I've purchased >300 of these and now have to find a different source. Bummer, because better documentation is nearly useless. Does anyone know the cutoff voltage for this battery? We're using these batteries in the MinXSS-2 CubeSat which should be launched into orbit in 2018 October! Is there a datasheet? I see the MSDS and the connector sheet... but not the regular datasheet. Is there any data on the parasitic losses from the on-board circuitry? I am sourcing batteries for a outdoor solar-recharged project with limited solar capacity so every point of loss is very important. Incredibly long time on a charge. I have purchased two of these batteries. One for a Blynk Board project and the other for an ESP8266 Thing - Dev Board. Each project runs for over 24 hours on battery power with typical LED's on and blinking & no sleep mode. This battery backup is just right for these projects when mains goes down. Some local power outages have lasted more than 12 hours making this battery a must. I added a JST Jumper 2 Wire Assembly, Lipo Charger Basic Micro USB & USB MicroB Plug Breakout to the Thing - Dev Board to accommodate charging this battery. 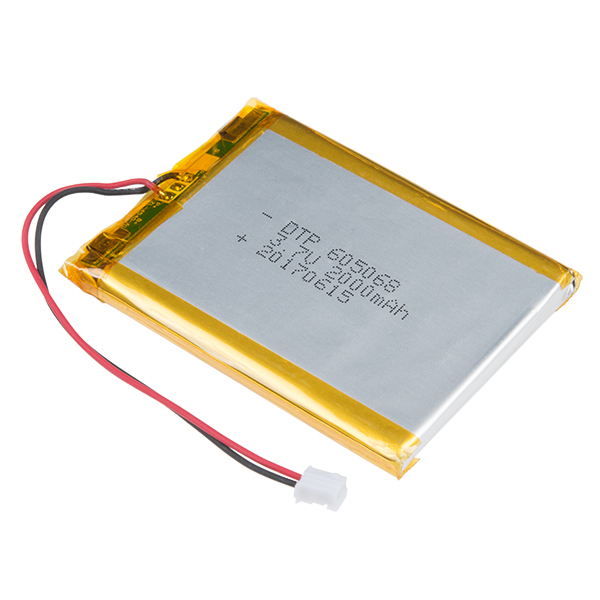 This is a good battery for replacing failing batteries in small low drain devices like radio, phone, Mp3s players. I did find that the 2000 mAh rating is assuming a less than 500 mA discharge rate as anything over that begins to drag the capacity lower and a 1A discharge rate reports closer to 1450 mAh than 2000. I would avoid use in high drain devices. The battery worked as expected. Sparkfun's Lithium-Ion Batteries are reliable and consistent. I don't know what else you want from a battery. It has taken my projects from unpowered and useless to strong productive members of my robot army.